Grubb’s Grocery is proud to be Jackson Tennessee's and Madison County's only full-service, locally-owned and operated natural and organic market. We carry every major and minor grocery and beverage category including general grocery; dairy and perishables and cheeses; organic and popular wines; fresh meat and seafood; frozen foods; bulk herbs, bulk foods, bulk coffee, and bulk water; nutritional vitamins and supplements; health and beauty products; local and regional craft beers in bottles and cans, and on draft; household and general merchandise; fresh, local and organic produce; and natural pet foods and pet products. 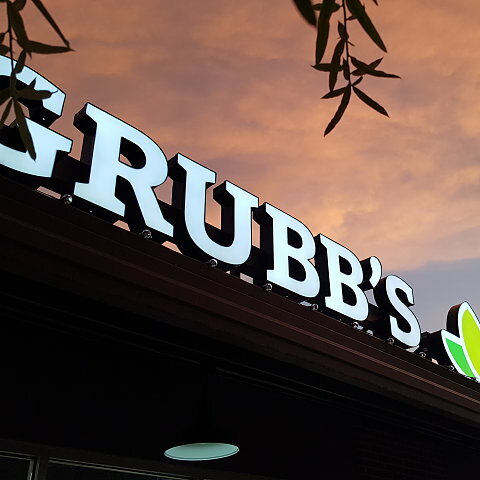 Grubb’s Grocery also houses a full-service deli with made- to-order sandwiches and panini, “grab-n-go” prepared food items, as well as a soup and salad bar featuring a selection of fresh soups on rotation daily. We serve a full, hot breakfast Monday - Friday from 7:00 - 10:00 a.m. A full-service fresh juice and smoothie bar round out our prepared foods and beverages. Last, we will feature “Grubb's Growlers & Brews',” which is our version of a “beer cave” and growler filling station for both beer and draft Kombuchas. Of course, when laws permit, we’ll introduce a full selection of popular, organic, and sulfite-free wines. All our products are free of artificial ingredients: no artificial flavors, colors, fillers, thickeners, sweeteners, or preservatives. See a full list of food ingredients we won't sell here. Our focus is and always will be local, regional, and organic when available and competitively priced. And we carry only humanely raised and processed, hormone-free, natural beef and poultry as well as freshest fish and seafood available. Grubb’s Grocery is located in the vibrant Jackson Walk development right in Downtown Jackson. We’re next to the West Tennessee Farmers’ Market and the LiFT Wellness Center. There’s plenty of free parking all around our store and we’ll be open seven days a week (with business hours coming soon). We accept all major credit cards (Visa, MasterCard, American Express, Discover), debit cards, personal checks with identification, EBT, and cash.